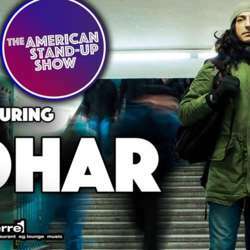 The American Standup Show Basel is back with another amazing English Standup Comedy Show! Introducing our very special guest comedian Dharmander Singh! Dharmander Singh was born in Birmingham in the mid 70's as a first generation British Asian. He started in theatre from a young age and graduated to stand up comedy in his late 20's. He successfully ran the Birmingham comedy club "Custard Balti". In Protected content , Dharmander did an early "Brexit" and moved to Berlin, Germany. He has been entertaining crowds with his own show as well as headliner and MC all over Europe and the Middle East for over 15 years. As a comedy festival regular, Dharmander recently performed at the Edinburgh Fringe Festival with his acclaimed one-man show "Bollywood and Birmingham to Berlin and Brexit". He has appeared on BBC radio on several occasions and featured in the Scottish BAFTA winning film "Crying with Laughter". Dharmander is the compere and co-promoter of the popular club “Cosmic Comedy” which produces sell-out shows in Berlin. As always we will also feature a mix of our loveable & hilarious local comedians! Come on down to Parterre One Music for an evening of hilarity, drinking and great comedy!